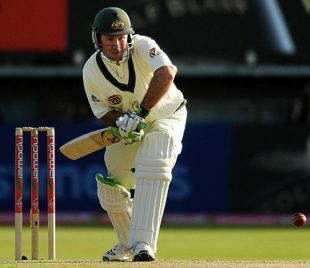 Ricky Ponting ended Allan Border's 22-year reign as Australia's leading Test run-scorer when he went past 11,174 career runs during the third Ashes Test at Edgbaston. We took the opportunity to look at who held the record for Australia before Border and Ponting, and the list of progressive record holders for all the other countries. The first column in the tables shows what the record was before the batsman overtook it, the second denotes his career runs after the match in which he broke the record, and the third indicates his aggregate at the end of his last match. Greg Chappell held Australia's record for nearly three years before Border, and he achieved it in his final Test. Chappell started the Sydney Test against Pakistan in 1984 on 6928, 68 runs short of equalling Don Bradman as Australia's highest run-scorer. At the end of the second day Chappell announced his retirement, on the third he went past Bradman, on the fourth he was dismissed for 182 and became only the third batsman to score a hundred in his first and last Test. Chappell also caught Mohsin Khan in Pakistan's second innings - his 121st catch - and beat Colin Cowdrey's record for the most catches in Tests. Bradman held the Australian record - 6996 runs - for nearly half a century before Chappell overtook him. Surprisingly, though, Bradman was never the overall highest run-scorer in Tests for he was chasing Jack Hobbs first and then Wally Hammond throughout his career. Bradman played 33 fewer Tests than Hammond and ended his career 253 runs short of the world record. Four of England's highest run-getters were also the world-record holders for most Test runs. The national and international records passed on from Hobbs to Hammond and then to Cowdrey, who finished with 7624 runs. Garry Sobers then became the first player outside Australia and England to possess the world record, before Geoffrey Boycott, who had become England's highest run-scorer by passing Cowdrey during the 1981 Ashes, became the fourth and last England batsman to break it. Graham Gooch is the current England record holder, and the closest of the current crop is Andrew Strauss, who has 5101 runs. South Africa's isolation meant that Bruce Mitchell, who scored 3471, remained their highest run-getter for nearly 52 years. After their re-admittance, however, the record was broken by Gary Kirsten, Hansie Cronje, and Kirsten again, before Jacques Kallis claimed it by going past 7289 during the Antigua Test in 2005. His 147 was one of eight centuries in that Test, a world record for most three-figure scores in a match. Kallis' aggregate is now 10194 and he's still accumulating. Graeme Smith is closest with 6330. Brian Lara became West Indies' highest run-scorer in his 98th Test, overtaking Viv Richards' aggregate of 8540 during an innings of 191 in Bulawayo in 2003. Lara overtook Border's world record by scoring a double-century at the Adelaide Oval in 2005, a match in which the world's highest wicket-taker (Shane Warne) bowled to the world's highest run-scorer for the first time since 1886-87, when Fred Spofforth bowled to Arthur Shrewsbury in Sydney. Lara's final total of 11,912 is likely be the West Indies record for a while because the closest contender, Shivnarine Chanderpaul, is 34 and has only 8576. New Zealand's record is held by Stephen Fleming, who went past Martin Crowe's aggregate of 5444 in Chittagong in 2004. Fleming retired from Tests with 7172 runs and it's hard to predict who's going to overtake him because the highest aggregate among the current players is 3212 and it belongs to Daniel Vettori. Sunil Gavaskar became India's highest run-scorer in November 1978 when he overtook Polly Umrigar, who had scored 3631. Gavaskar finished with 10122, having claimed the world record from Boycott when he passed 8144, and his Indian record stood for 27 years until Sachin Tendulkar broke it against Pakistan in Bangalore 2005. Tendulkar has since broken Lara's world record as well. Zaheer Abbas had played 17 Tests and scored 1049 runs before Javed Miandad made his Test debut. A few months after Abbas broke the Pakistan record for most runs - Majid Khan's 3931 - in January 1983, Miandad caught up with him. They passed each other several times during the course of the year and Miandad eventually took the record as Abbas' career came to an end at 5062 runs. Miandad claimed the record permanently in the Faisalabad Test against Sri Lanka in 1985 - Abbas' penultimate match - and has held it ever since. Inzamam-ul-Haq came extremely close to breaking it. Playing his final Test innings against South Africa in 2007, Inzamam needed two runs to equal Miandad. He stepped out to Paul Harris, looking to loft him for six, but missed and was stumped on 8830. Among Pakistan's present batsmen, Mohammad Yousuf is closest on 7023 runs. Sanath Jayasuriya broke the Sri Lankan record when he passed Aravinda de Silva's 6361 in Karachi in 2004, and held on to it until he retired after the Kandy Test against England in 2007. In the very next match, though, at the SSC, Mahela Jayawardene broke Jayasuriya's record of 6973 during his innings of 195. Jayawardene is currently on 8418 and is likely to stay ahead of his nearest competitor, Kumar Sangakkara, who's on 7095. Andy Flower's aggregate of 4794 when his career ended after he protested against the Mugabe regime in 2003 remains the Zimbabwe record, while Bangladesh's highest run-scorer is former captain Habibul Bashar who ended with 3026. If there's a particular List you would like to see, email us with your comments and suggestions.